The Terrace01493 842000work Restaurant - EnglishThe Terrace at The Imperial Hotel is a unique venue in the Great Yarmouth area. 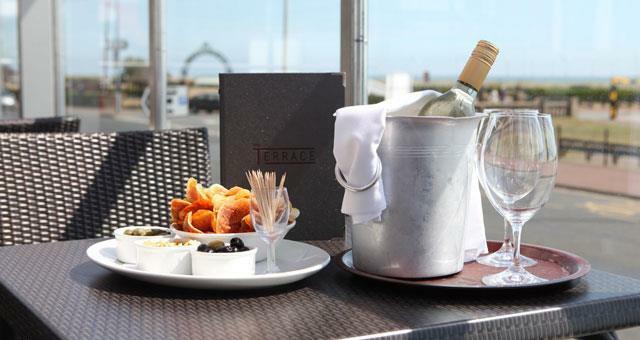 The fully glazed terrace has a stunning sea view and electrically operated retractable roof and side panels for those sunny days and balmy evenings, but should the weather turn chilly we have excellent outdoor heating. From April to November we are open from 7am until 9pm 7 days a week. We serve breakfast, lunch, snacks, afternoon tea and dinner or just call in for a coffee or tea, a glass of wine or beer, enjoy the view and read the complimentary newspapers. The Terrace at The Imperial Hotel is a unique venue in the Great Yarmouth area. The fully glazed terrace has a stunning sea view and electrically operated retractable roof and side panels for those sunny days and balmy evenings, but should the weather turn chilly we have excellent outdoor heating. 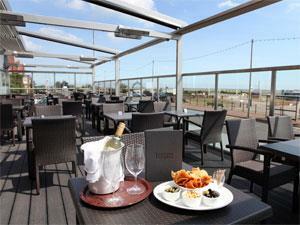 Please visit our website www.imperialhotel.co.uk for the full menu and further details and pictures of the Terrace. Open everyday from 7am until 2pm for Winter & 7am until 9pm Summer (some parts of the day The Terrace may be closed due to events held at the hotel -call us to avoid disappointment).